We finally got our backyard landscaping and pool all finished (I'll post a few other pics to our thread soon) and now we're working on the front. Not sure if I can post about that here but you guys are so helpful with everything I wanted to try! We ripped out some ugly bushes and a tree I've been hating on for 10 years but now we need to get something in to replace it. 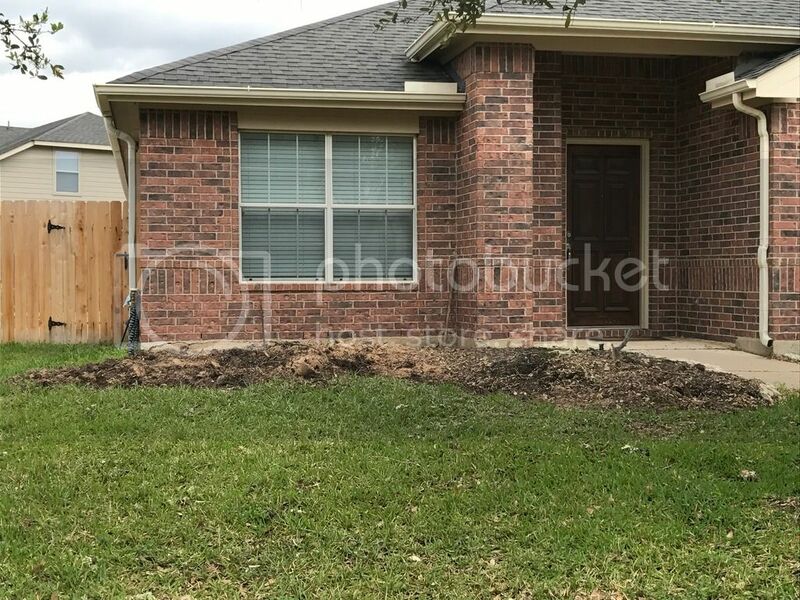 I have some flowers and a tree we bought but need some good ideas for curb appeal and low growing shrubs, etc.
. 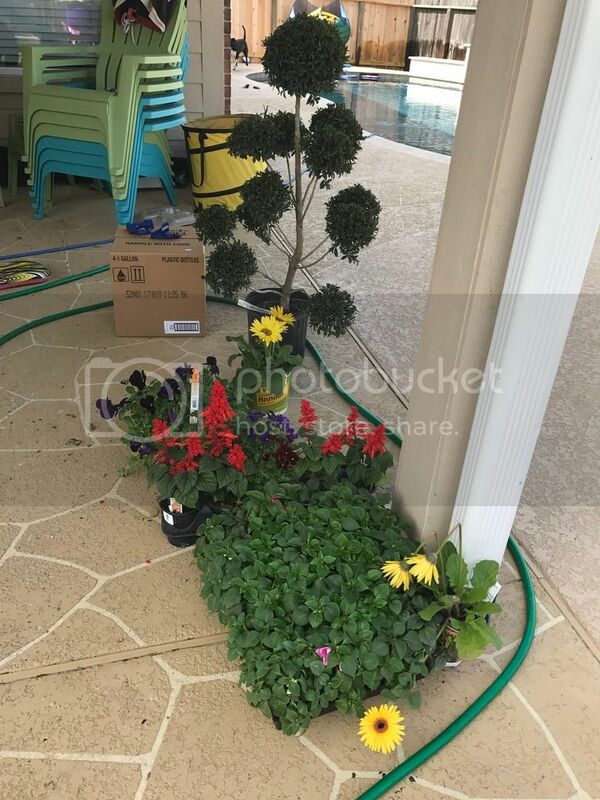 Some begonias, salvia, this ball tree thing... lol. If they don't work in the front we can put some in back and get something different. Prefer lower maintenance and things that don't have to be replanted. We're in full sun most of the day. Any ideas for this space? Hmmm.. I think I really like the Lemon Lime Nandina. Those Daylilies are gorgeous and they have some varieties at the nursery I'll have to look at. I also like the look of Hosta. Should I look at drift roses too or just knock-out? It's a pretty large space. Any design ideas for people on a budget? Ooh! Has Suz been around? She always has beautiful landscaping ideas. She has not been around for a little while. You can always PM her to give her a heads up. She is having work done to the inside of her house so busy with that. Are you sure those are begonias? They look more like impatiens, which need shade. If you belong to Costco check the great bulb selection that I saw there today. I picked up some nice ones and they have some for shade, some for full sun and some for mixed sun/shade. Not a bad price either. Daylillies are wonderful, and we have tons of those too. They do well in hot sun. Not a terribly long bloom time but gorgeous when they are. How about a big patch of Black Eyed Susans (perennial) which are tall, with lower annuals in front of them to fill in the bed? We bought the begonias from a fundraiser. They're supposed to be Olympic mix begonias but they were selling impatiens too. How would I be able to know the difference? The tray of them without flowers yet right? I'll look at the Black Eyed Susans. I was just thinking that annuals may turn out cheaper in the long run. The leaves of a begonia tend to be a bit glossier. You can start things from seed in the back of the garden bed while you put out annuals this year in front. Then as the garden develops you'll figure out how to fill in the spaces. It looks to be a very sunny spot so find things that require sun. Little lime hydrandgia (not the full size. little lime gets only 3x3 or 4x4) great foundation plant. color from late summer till freeze up in NE. Knock outs like mentioned. If you want somethign for infront of these little lime's then carpet rose's or even better drift roses. the bloos on them are 1000x more than knock outs even but again they are low growers. Any kinda coneflower other than the typical purple cause everyone has them. look for the hybrid varieties that have the fluffy tops. Day lilies. not the yellow or orange. look for double day lilies. look for hybrids. wacky colored ones. these are my go to plants for anyone who wants color from early summer to winter. only pruning needed is at end of season and the roses should be pruned rigth before thaw out up here to push more growth. never before frost cause they need thier leaves during the winter for protection. landscapers prune in the fall cause they aren't as busy and don't care out people's following year. ever flower has a proper pruning time. biggest thing to remember. they dont' all get pruned at once the same time of the year usually. check out my flker account if you want to see some pics of diff stuff. this will take you to the folder with some random stuff. I don't do any everygreen stuff. i like color. Yippee, you were right! They're impatiens. I'm trying to see if they can still give us the begonias we actually ordered. Do the knock out and drift roses have thorns? Jim, those pictures are gorgeous! Love the daylily Night Embers. Do you have a place you get your plants from or do you go to a local nursery? Do you have a place you get your plants from or do you go to a local nursery? Are you sure those are begonias? They look more like impatients, which need shade. I bought some sun loving Impatients last year. They did really well through the hot TEXAS sun from May to November. I know most are not but there are some that can handle the sun and heat. They actually surpassed my expectations. I am by far not an expert. Is that what the sun loving impatients are called? Sunpatients? They lasted a really long time. I reached the lady I got them from and she knew one had been mis-delivered but didn't know where. They're going to swap it out for us on Wednesday. Yes, both knockout and drift roses have plenty of thorns. One the Echinacea newer varieties is a mix called Cheyenne Spirit which I think is gorgeous. http://www.whiteflowerfarm.com/28432-product.html. A good casual sun perennial backdrop for echinacea is Russian sage. Daylillies fit right in with all those things. All of the above is if you are looking for a cottage garden style. It is informal, free flowing and does need an annual shearing. And the above is budget friendly. For a bit more formality which is common for a front landscape (I like a combo myself) you would ideally have a mix or a few groupings of flowering evergreens as the backbone and front either with flowering perennials or other lower growing flowering ground covers. I'll leave the suggestions for your climate to others for that approach on the shrubs. Sunpatiens is probably a trademarked name, another is New Guinea Impatiens.